The game of netball is certainly the most adventurous sporting event. Once considered as the sporting event for women, this game is now played both by males and females. This game is played on the rectangular court. The players need to shoot the ball in the pole. This game involves tremendous physical agility. So, the players need to wear comfy fabric for this purpose. The netball uniforms manufacturers are offering collection in the comprehensive range of designs and specifications. Nowadays, the players and teams demand for customized collections. These collections are specially created as per the requirements of the teams. The managers or clubs provide the specifications related to the designs and the designers create the collections for the same. The most popular form of fabric which is widely used for this purpose is polyester. This is considered as the most comfy fabric in regards to the manufacturing of the sportswear. The players have to run and have to show tremendous physical agility. This fabric helps in providing complete comfort and flexibility to the players. With this, they provide their best performance. 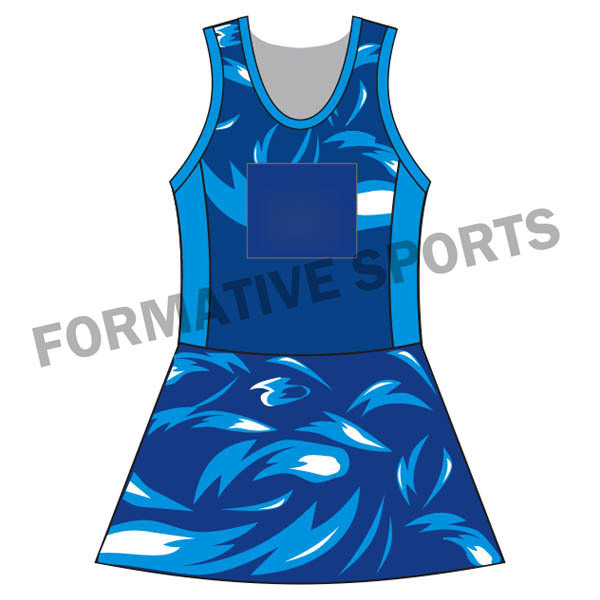 Buy directly from the leading Netball Uniforms Manufacturers - Formative Sports at best price.